Elegance, grace and modernity are the three words, which describe this room concisely. The décor of this master bedroom is the perfect example of the “dernier cri” of interior design, the much sought after contemporary look that is quite the rage nowadays. The immaculate white interiors of the room is much in vogue now, with the pristine white walls and the sectioned lighting from above the ceiling and behind the headboard of the bed. The monotony of white however is broken with the shiny wooden hues of the furniture and the floors. 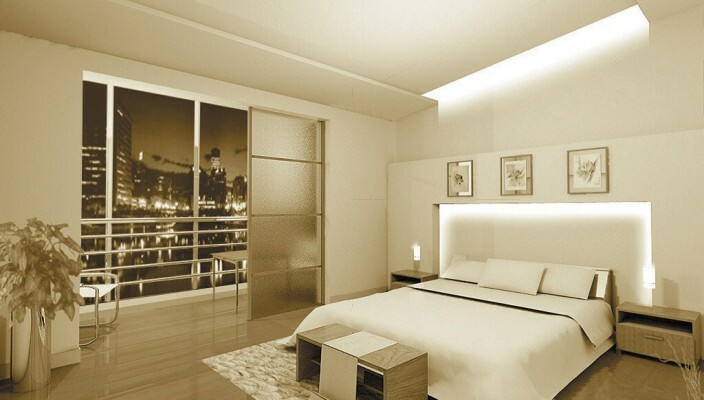 A sliding glass panelled door overlooks a breathtaking nightscape, brought to life by the shimmering lights of the skyscrapers, dotting the night sky. Houseplants add another touch of much needed colour and inspiration to the bedroom, as do the paintings of the headwall. This bedroom is the paragon of sleepy serenity that provides a dreamy allure to a wary person, who slaves his days off in the confines of his work and mind.